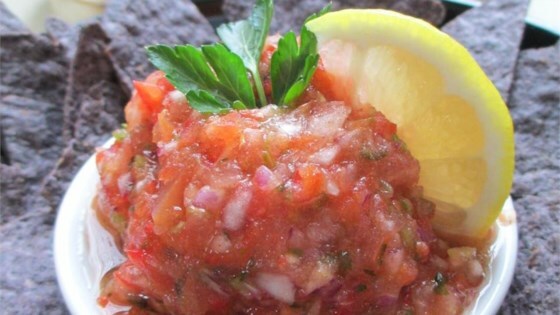 "This is a very good salsa recipe. Simple ingredients are boiled and blended to created a flavorful, spicy mixture that's great with tortilla chips and on Mexican-style foods. The amounts of onions and jalapenos may be varied; canned crushed tomatoes may be substituted for fresh." Bring a large saucepan of water to boil. Briefly place 6 pounds tomatoes into water to loosen skins and set color. Drain, peel and crush. Mix chopped tomatoes, garlic powder, lemon juice, salt, cayenne pepper and cumin into the saucepan with crushed tomatoes. Whip to desired thickness. Bring to a boil. Mix in red onion, white onion, yellow onion, jalapeno peppers and cilantro. Continue boiling until vegetables are soft and mixture has reached desired consistency. Remove from heat. Refrigerate until serving. Vibrant condiment sauce made with tomatillos. My husband & I make and can salsa every year with the vegetables from our garden. We have tried many recipes and this is the best by far. This one is great and easy! You can adjust for your salsa tastes--I added more cilantro and lime juice in place of the lemon. I also just chopped all my tomatoes on the second batch.